Magic Lantern #53. Another view of #52. Probably being dismantled. Magic Lantern #54. Removed from the set sometime in the past. Magic Lantern #55. Second School House - 1851. Replaced by Third School. This one faced south. Magic Lantern #56. Fourth and Broadway looking South. Note Crisis Building on right. Also see type of streetlight top of the picture. Magic Lantern #58. 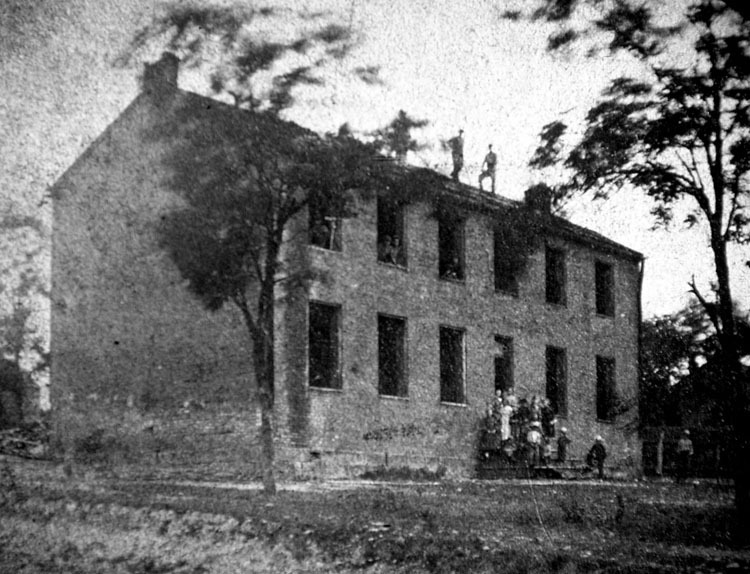 First brick house. 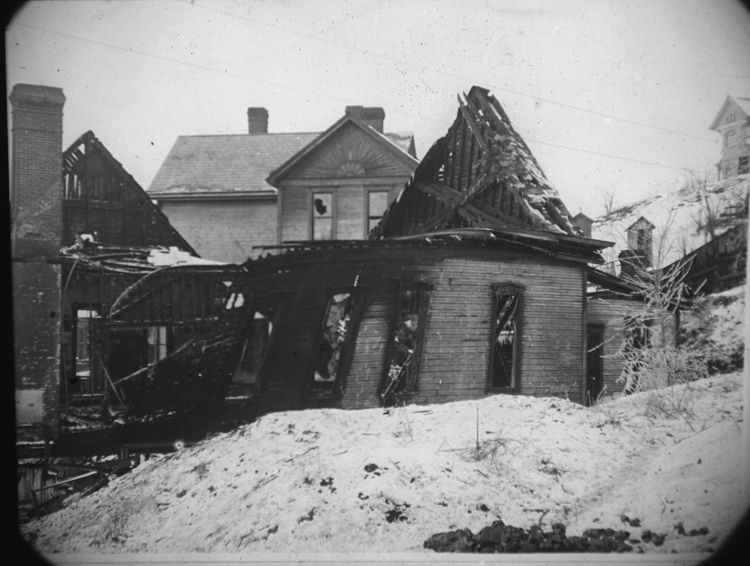 Torn down when American Legion house was built. Salvation Army now in 1978. Magic Lantern #60. West side of Market at Fourth Street looking north. 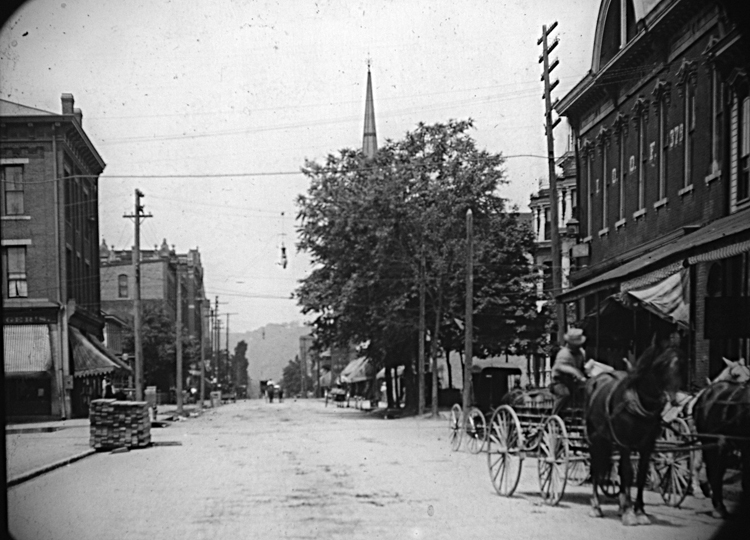 Building at left is on Fourth and Market 1875. Magic Lantern #61. This building built by a Mrs. Wells. Later became the East Liverpool Post Office. Now home Moose Lodge. Corner of Fourth and Washington Street across from the Y.M.C.A. Magic Lantern #65. Ruins of the Christian Church after fire. Elm Street? Site of old parsonage. Magic Lantern #66. Ruins of the Christian Church after fire. Elm Street? Site of old parsonage. Magic Lantern #67. The Bradshaw Hall and theater. This building was used as a meeting place by the congregation of the Christian Church after the fire. 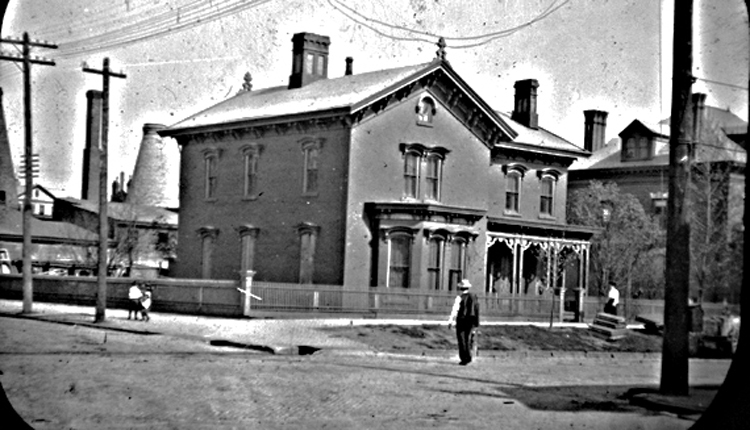 Located across the street from Brunt home, now post office. Present site of standard oil station 1983. Magic Lantern #68 Odd Fellows building. Showing part of Washington St., North. Magic Lantern #69. Fifth Street looking west from Washington. Odd Fellows building on right foreground. Note front of Lee home where Ogilvie's is now. Magic Lantern #70. 5th St. and Diamond looking West. Old M. E. Church and left background. Andrews ice wagon. Sold ice from pond in California Hollow. Magic Lantern #71. Fifth Street looking west. Showing part of old U.P. Church. Note little store on site of high Ikirt Building. Magic Lantern #72. 1885. Store mentioned on previous slide. N. E. Fifth and market looking towards diamond W. H. Travis Grocery.